Fit 4 Life: Boxing Clever: Alexandra Park School is piloting an exciting initiative as part of their ‘Healthy Schools’ focus. 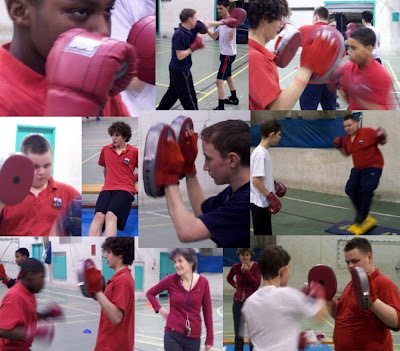 The aim is to encourage young people to build a healthy mind and body through boxercise sessions, that a select group of students attend one afternoon a week instead of their normal curriculum lessons. APS Learning Mentors, Inclusion Team and School Sports Coordinator have devised a programme where a small group of students from Year 7-9, who we feel would gain the most benefit, are invited to attend one afternoon a week instead of their normal curriculum lessons. Mr.Amooty (APS SSCo & fully qualified Boxercise instructor) leads the sessions, where students are taught the basic skills of boxing in a non contact environment. However the emphasis is firmly on having a fun, challenging work out and building personal and social skills such as self discipline, persistence, team work and cooperation. Students have the chance to make new friends and the importance of a healthy life style and a balanced nutritious diet, are highlighted with students being treated to a fruit platter & healthy smoothies after their work out . Students are targeted if we feel that ‘Box Clever’ will increase their physical, mental or social well being. Parents are required to support their child with their organizational skills to ensure they come prepared with training kit. There will hopefully be an opportunity to introduce the students to a local boxing club, so as to show them the possibilities of extending this activity in their own time. Parents are to be invited to share in their child’s achievement at a celebration ceremony at the end of the initiative where students will demonstrate their new skills.